I used to be a fanatic bass fisherman (No, Little George, I didn’t say fantastic, I said fanatic). I went every chance I got. I fished for fun and I fished in tournaments and everything inbetween. I bass fished just because I am. There was no thrill in the outdoors for me greater than catching Mr. Bass. During that time, I developed a love for one lure above all others. I caught fish on it everywhere I went under almost any condition. It became my trademark, my go to lure and my best friend in the boat. It was the Mann’s six-inch black grape Jelly Waggler. It was introduced in early 1979, as witnessed by the announcement to the left from the Feb. 1979 Field & Stream magazine. Production on the lure stopped about 15 years ago. When I found out, I was stunned. Fortunately, I had a few contacts at Mann’s Bait Company in Alabama at the time and managed to contact Suzanne Newsome in the public relations department. She laughed when I told her about my addiction and even though she passed my desperate pleas on to the manufacturing folks, they did not start up making them again. They make some black grape worms. But they are not the same. The waggler, apparently, is gone. It has no more chance at coming back as a fishing lure as Bear Bryant does as Alabama’s football coach. At the time I contacted Suzanne, she found a dozen 100 count packs of the worms left on a shelf in the warehouse. I bought every one of them. Over the years, I’ve used them carefully and kept them in a safe place and used them sparingly. Oh, Mann’s does make some 12 -inch Super Hard-nose Jelly Worms now and a 7-inch jelly worm with a straight tail. I hate to be a hard nose myself, but there is just something about that little curly tail on a waggler that fish love. Most bass today will never get to see one, though. If they do, it will be too late for them to tell anybody about it because they’ll be going in my livewell. Last year, I opened up my last bag of Mann’s six-inch black grape jelly wagglers. Today, there are 19 left. Nineteen. That’s one less than 20. YIKES! If I catch two per worm, that’s a maximum of four Louisiana limits of largemouths. Nineteen six inch black grape jelly wagglers left on the planet as far as I know. 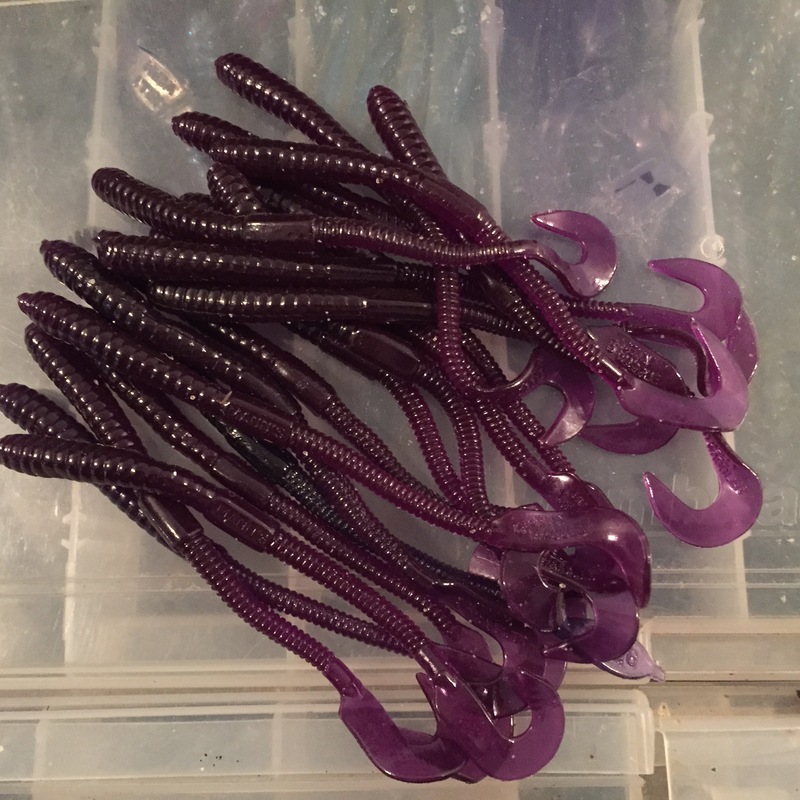 I did find a couple of packs of grape jelly wagglers for sale on EBAY a few months back. Grape is okay, but BLACK grape is special. As is the curly tail on the WAGGLER. Fish know the difference. When these are gone, that could be the last straw in making me a full-time crappie fisherman. Oh happy day for you, Mr. Bass. Here’s a black grape Jelly Waggler bass from earlier this year! Kinny, know how you feel. For years, my favorite bass worm for late summer and fall in the Kisatchie lakes was the Zoom Ring red/black core in either 4 or 6 inch. I found a closeout a few years back and bought the few packs they had left. Ran out last year. Thanks to a tackle shop in NC they were able to get Zoom to make a special run. Cost me about $200 but I’m set for another 5 years! Great minds think alike, Kinny. That was my favorite “go-to” lure by far. I even had some luck with the “Blueberry” flavor which produced an 8 lb. 1 oz. bass for the top prize while fishing a tournament on Lake Claiborne in 1979….and that was before the days of Florida bass when an 8 pounder was something everyone talked about…..MY HEART BLEEDS FOR YOU !